and inscr. lower right: ‘Sir H. M. / Stanley’. From the beginning of 1890, upon his return from the high-profile Emin Pasha Relief Expedition, Stanley’s status as world-famous African explorer and writer was sealed. Yet this was to be his last overseas adventure and as the decade progressed he embarked upon a political career, eventually being elected as Liberal Unionist candidate for North Lambeth in 1895. He was an unenthusiastic politician, and agreed to stand only after persistent encouragement from his ambitious wife, who also hoped to divert his focus away from a possible return to Africa. Stanley did not enjoy the role; he actively disliked the long hours and stale air of the House of Commons, and the endless speeches about matters that did not interest him. Max Beerbohm similarly had little interest in politics, although he had a fascination with politicians themselves. He believed that the public were likewise interested in the ‘purely personal side of politics’. When I draw a man … I see him in a peculiar way: I see all his salient points exaggerated (points of face, figure, port, gesture and vesture), and all his insignificant points proportionately diminished.… In the salient points a man’s soul does reveal itself, more or less faintly.… It is … when (and only when) my caricatures hit exactly the exteriors of their subjects that they open the interiors, too. Careful deployment of horizontal lines across the cheeks hints at the physical effects of years of arduous exploration. If there is arrogance in the pursed and upturned lips, there is also unease suggested in the diverted gaze and furrowed brows, as if Stanley is not wholly comfortable in his environment. The artist perhaps referenced the appearance of the sitter in numerous studio photographs throughout his lifetime, the stern and guarded attitude into which he arranges his features not quite concealing the disquiet glimpsed beneath. This caricature was purchased – along with seven others – from the Leicester Galleries (Ernest Brown & Phillips Ltd.) in 1953. It is inscribed ‘Sir H. M. Stanley’. However, as the sitter did not receive the Grand Cross of the Order of the Bath until 1899, either the attributed date of 1897 is incorrect, or the artist signed the work some time after it was executed. 2) Quoted Hall 1997, p.148. 3) Press cutting, unidentified publication [22 Aug. 1895], Stanley Archive, Royal Museum for Central Africa, Tervuren; quoted Jeal 2007, p.237. 4) See Hart-Davis 1988, pp.35–6; quoted Hall 2004. 5) See NPG RP 3851–3858. 6) Jeal 2007, pp.425 and 456. 7) Ref. Hart-Davis 1972, p.142, no.1584, where dated 1897. 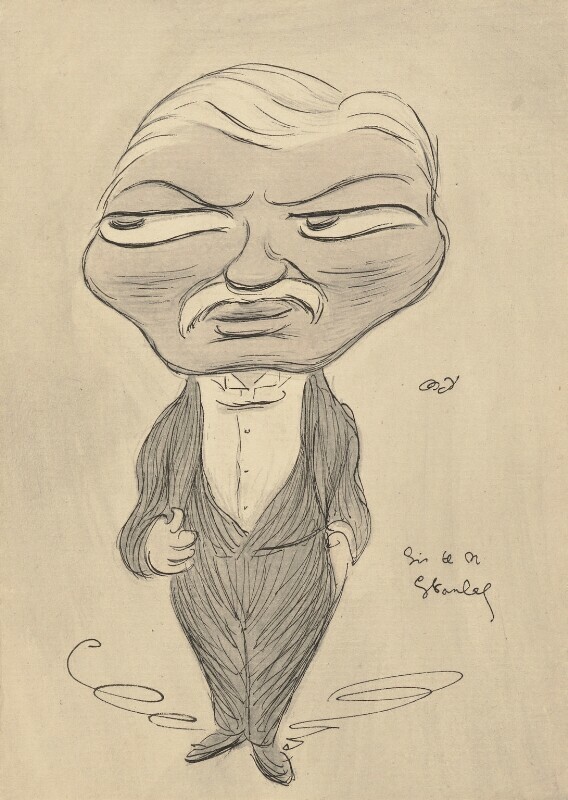 Caricature drawing with diminutive body and oversized head, whole-length to front, eyes to left, standing, with white hair and moustache, wearing dinner dress. Purchased from The Leicester Galleries (Ernest Brown & Phillips Ltd.) in 1953.